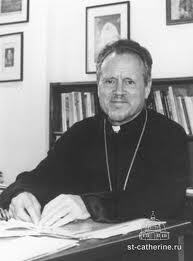 Sunday, July 22, 2012 marks the 20th anniversary the repose of Protopresbyter John Meyendorff, Dean of Saint Vladimir’s Seminary from 1984 until 1992. A better way to speak of Father John’s repose would be to say that he died “in hope of the resurrection.” These words are used in Orthodox prayers for the departed. Father John’s theological vision, in accord with the great Christian theologians, affirmed and celebrated the dynamism of our life and our movement toward the resurrection. In remembering Father John and reflecting on his life and ministry, it is clear that he was a theologian of depth and a teacher of excellence. In this he witnessed to Christ, to the Gospel, to the Orthodox Faith. He exemplified intellectual integrity and seriousness and was allergic to untruth in any form. Theology and teaching were not “academic” endeavors for Father John. He placed his intellect and his teaching in the service of the Church. In this sense, he was as much a pastor as he was a theologian and teacher. During the years of his labors as theologian and historian, teacher and lecturer, Father John achieved respect and recognition around the world in the Orthodox Church, in the ecumenical world, and in academia. Among the Orthodox Churches, his voice articulated the vision of the Orthodox Church in America, affirming the imperative need for unity and mission. In the ecumenical and academic worlds, he articulated and bore witness to the Orthodox vision of God’s creation and the meaning and content of human life in light of the biblical teaching on the image and likeness of God in each human person. As editor of The Orthodox Church newspaper for 20 years, Father John made a major contribution to public discussion of the challenges facing the Orthodox Church in America and around the world. He saw his service as editor as a continuation of his task as teacher of theology and history. He knew that an educated and informed clergy and laity were necessary for a healthy Church. His birth and education in France were no obstacle to his love for America. On the contrary, he entered fully into the experience of American Orthodoxy, understanding its challenges and appreciating its gifts and possibilities. In the story of the autocephaly of the Orthodox Church in America, Father John was more than a teacher and scholar. He played a key role in the negotiations which led to the granting of autocephaly, working closely with Father Alexander Schmemann and the other members of the team charged by the Holy Synod with the responsibility for dialogue and negotiation with the Russian Orthodox Church. A central aspect of Father John’s thought and teaching was the calling of the Orthodox Church to overcome the limitations of national, ethnic Orthodoxy through a proper vision and experience of the unity and universality of the Orthodox Church. This did not mean for him that the national and ethnic realities should be despised or rejected. It did mean that the true vocation of the Orthodox Church cannot be confined to the boundaries of ethnic and national identities. This insight guided the “creators” of the autocephaly of the Orthodox Church in America, and still guides our vision of Orthodox mission in America. The various aspects of Father John’s life and ministry were complementary. Scholar and priest, teacher and educator, dedicated to the Orthodox Church in America, and honored around the world as a theologian, articulate voice for Orthodoxy in the ecumenical context – all of these dimensions were integrated and harmonious, and all were at the service of the Good News of Christ and the Church of Christ. When Father John received the Sacrament of Unction not long before his death, he said one word – “Eucharist.” When the Eucharistic Liturgy is celebrated at Saint Vladimir’s Seminary Chapel, the icon behind the altar table is the icon of Christ giving Communion to the Apostles. Father John’s vision and experience of the Church was deeply Eucharistic. As he approached the hour of his death, the Eucharist stood at the center of his vision. The life and ministry of Father John, as well as his sickness and death, were full of the hope of the resurrection. And this joyful hope is fulfilled in the Eucharist given to us by Christ.